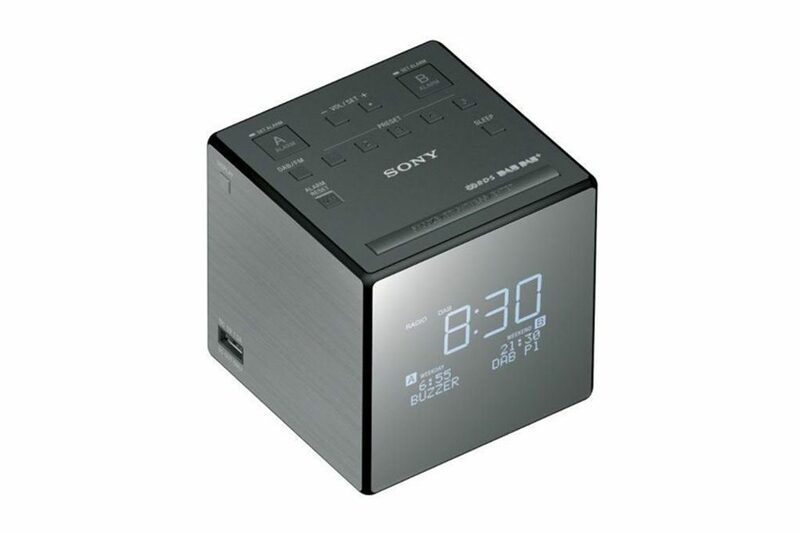 The Sony XDR-C1DBP is the latest in a line of cube shaped clock radios which can trace their heritage back to the original 1980’s Sony Dream Machine digicube. The radio sports a sleek, smooth design with sharp lines and a reflective surface on the front. Bright blue numbers for the clock and clear lettering for station details make it exceptionally easy to see in the dark. The clock and station display can be dimmed with four brightness settings. DAB/DAB+ Digital Radio and FM can be selected with a single button on the top of the radio. The tuning up and down buttons, as well as Enter and Back buttons, are found on the rear of the radio. As many listeners enjoy waking up to the same programme or station every day this shouldn’t be an issue after the initial set up. Five FM and five DAB presets are provided for with dedicated buttons on the top of the radio. Saving a plug socket at the bedside table is a USB socket on the side of the Sony XDR-C1DBP. This can be used to charge a smartphone, but Sony cannot guarantee that all devices can be charged from the port. A warning sound will indicate that a device should be unplugged from the port, and radio reception sensitivity may worsen when a smartphone is being charged. Dual alarms means two separate alarms can be set, either with FM, DAB or a buzzer. An alarm period can be chosen, with options for weekdays, weekends or both. This is ideal for using a buzzer during the week and the radio on weekends. A large snooze button silences the alarm for ten minutes. Further presses add ten minutes to the length of the snooze up to 60 minutes. The same button can be used to toggle the display brightness and a display button will change the information displayed below the time, including an option to switch off the display. On the rear of the cube a 4cm speaker provides mono sound for the radio, however there’s no headphone socket for private listening. The radio itself weighs just 560 grams with a thin wire antenna which can drop behind a bedside table. A CR2032 battery is included inside the radio to keep the clock and alarm working in the event of a power cut. Sony’s ‘No Power No Problem’ feature means that the alarm functions will work until the battery is exhausted in the event of a power failure. The battery does not provide enough power for the radio (a buzzer will sound instead) and the display will disappear. The battery is activated by pulling a tab from the slot, but can be replaced by opening a flap under the radio. The XDR-C1DBP isn’t the only cube shaped radio offered by Sony. The cheaper Sony ICF-C1B is similar in appearance but does not include digital radio. Verdict: Sony's XDR-C1DBP is a stylish digital clock radio with an excellent display. It follows the other DAB radios in Sony's range with logical button placement and good sound quality.